The 2018 Farwest Show, August 22–24 in Portland, Oregon, has scheduled two seminars that touch on subjects of particular concern and interest for nursery growers. The seminars will deal with the timely issues of pesticide use around pollinators and emergent technologies for efficient irrigation programs. Andony Melathopoulos, assistant professor at Oregon State University, will deliver his address, “Bees: A Four Letter Word, or an Opportunity for Landscapers and Nurseries?,” on Wednesday, Aug. 22, 9:45–10:45 a.m., Room B117. His talk, sponsored by GeoSeed, looks at concern around bee health over the past decade. He’ll share practical steps to safely use pesticides around pollinators and how to market services and products to capture this concern and turn it into revenue. The talk will also outline an Oregon initiative, the Showcase Farm and Oregon Innovators program, which showcases horticultural industries to consumers as bee-friendly. Melathopoulos leads OSU’s efforts to design, implement and evaluate a statewide pollinator health program. He provides annual training to more than 1,500 pesticide applicators, hosts a weekly podcast on pollinator health (PolliNation) and works to educate homeowners and landscapers on how to manage pests while minimizing impacts to pollinators. He sits on the steering committee of the Oregon Bee Project, which coordinates pollinator health work across state agencies. A second seminar, “Irrigation Scheduling Strategies,” to be jointly delivered by industry experts Travis Bates and Yassin Osroosh, is scheduled for Thursday, Aug. 23, 1:30–2:30 p.m., Room B117. This presentation will explain the importance of irrigation scheduling and provide information on various technology-based approaches to it. Bates and Osroosh will discuss using soil sensors, ag weather stations, plant sensors and thermal sensing methods for irrigation scheduling. They will also touch on important technologies for fruit loss management. Bates is a technical sales and support specialist for METER Group Inc. USA, with an emphasis on developing tools that facilitate crop decision making processes in the agricultural sector for agronomists, consultants, and growers. Registration is required for both seminars and available online at https://farwestshow.com/register/. 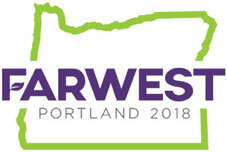 Complete details on the 2018 Farwest Show can be found at www.FarwestShow.com.